Back on 1 December 2016 Yahya Jammeh, Gambia’s president ‘for a billion years,’ lost an election and surprised much of the world when he said he’d accept the result and walk. Shortly after, to nobody’s surprise, he didn’t depart at all, but finally on 21 January 2017 he was persuaded to leave, flying off to Equatorial Guinea having looted his small country’s treasury on the way out. The new president is Adama Barrow. 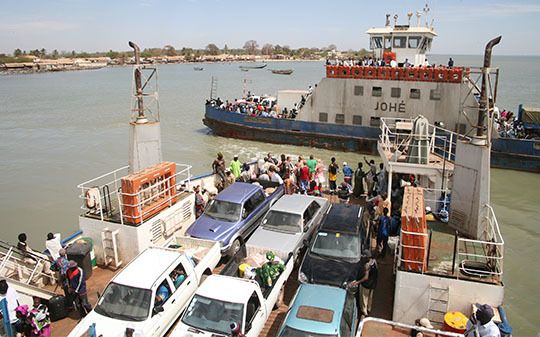 ▲ Crossing the Gambie River to Banjul, our car is the metallic blue one with the sunroof, lower right hand corner. ◄ Back in 2007 Maureen and I drove to Banjul in Gambia on the Plymouth-Banjul Challenge. Buy an old car in England, drive through Europe and down the West African coast through Morocco, Mauritania, Senegal and finally to Gambia. Where if you make it to the finish line you give your car away and it’s auctioned off, the money going to local charities. Our 1989 Mitsubishi effectively doubled its value from around US$700 which we paid for it to the local equivalent of US$1400. The gentleman in green was the happy new owner. The day before our trusty Mitsu (it got us through Europe and Africa with no problems) was sold I left my hotel to drive down the road to the main Kololi beach strip and at the junction I was stopped by the police and sent back to the hotel, on foot, to get my driving licence and insurance certificate. Neither was even glanced at when I returned but my car had to remain by the roadside, parked, until 1pm. It seemed only the president and his cronies were allowed to drive anywhere on Saturday mornings. 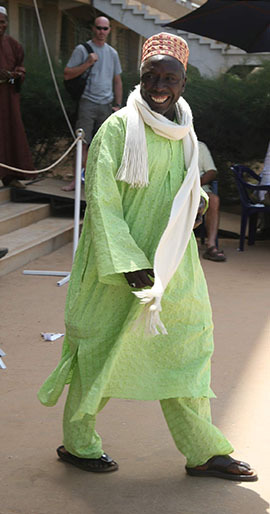 A typical tinpot dictator dictate I guess, well Jammeh was probably busy perfecting his banana-based cure for AIDs.